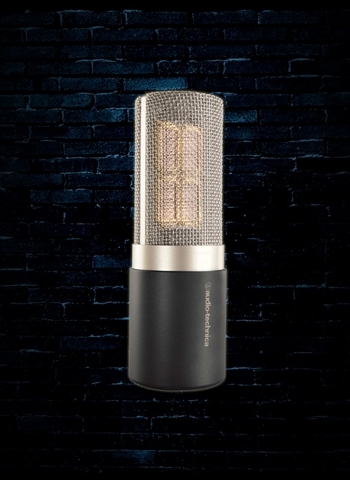 Audio-Technica's premier studio vocal microphone – the AT5040 cardioid condenser – proudly stands at the front of its class, continually earning rave reviews across the board. Created as the first microphone in our flagship 50 Series, the AT5040 represents a milestone in condenser design, offering remarkable high-fidelity musical performance, with profound realism and depth, presence and purity of sound. At the forefront of our design criteria for the AT5040 was purity of sound. To achieve this, Audio-Technica engineers developed a four-part rectangular element, the pinnacle of our recent breakthroughs in sound-capture technology. Four exquisitely matched ultra-thin diaphragms function together (with outputs proprietarily summed) as Audio-Technica's largest-ever element, providing combined surface area twice that of a standard one-inch circular diaphragm. As much as we admire the great microphones of the world, our 50 Series cardioid condenser is pure innovation, not emulation. Wherever your passion for music takes you, listen for the purity, presence, depth and detail of Audio-Technica's AT5040 - the standard in studio condenser microphones.